T/Sgt Lloyd G Stitely. Miller in front. MS 1944. 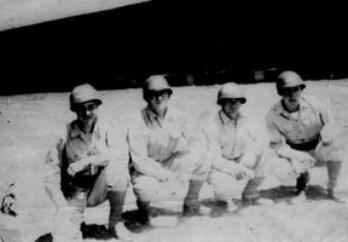 First on the left is S/Sgt Marion G Schmidt. Go to Miscellaneous Photos Page 57. Infantry Regiment, Cp Van Dorn, MS 1944. 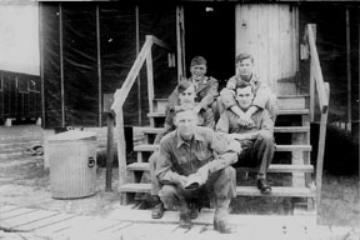 63d Band on manuevers, Camp Van Dorn, MS 1944. Dolan (back to camera), Bernie Marquis, W. O. 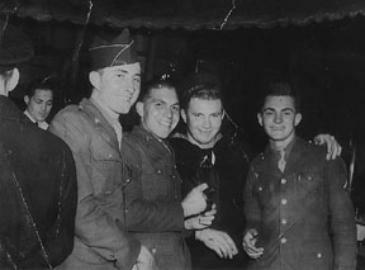 63d Band members take a break from training in the "Nazi"
Card, George Marble, John Campbell, Clyde Baker, Richard Hunter, Alton Landers, John Bovell and Artie Engler.